Petite Address Plaque with Fleur de Lis - - prestige arch one-line sign personalized with the address you specify. Small sign -- big impact. Made in USA. 9"W x 5.5"H petite size sign. Wall mount or lawn mount with the optional lawn stake. The one line of personalization holds up to three (3) 3" or four (4) 2" characters. The narrow border accents the prestige arch shape and is the same color as the fleur-de-lis emblem. 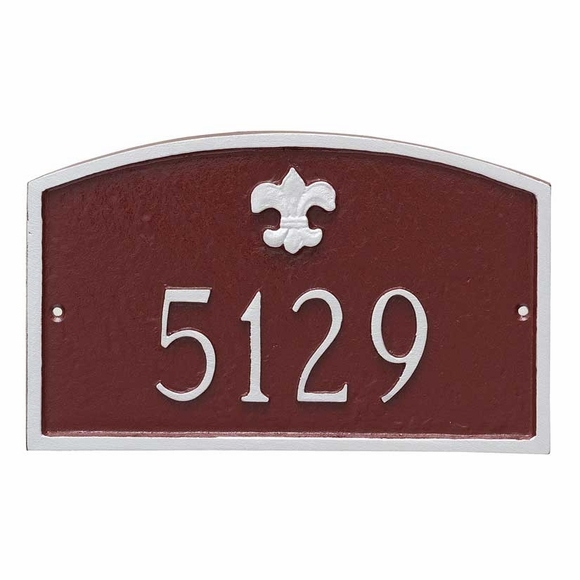 Small personalized house number plaque is perfect for townhouses and other common-wall homes, brownstones, columns, garages, back fences, or side doors. Made in USA. Q: Would this be centered since our address is only three numbers?